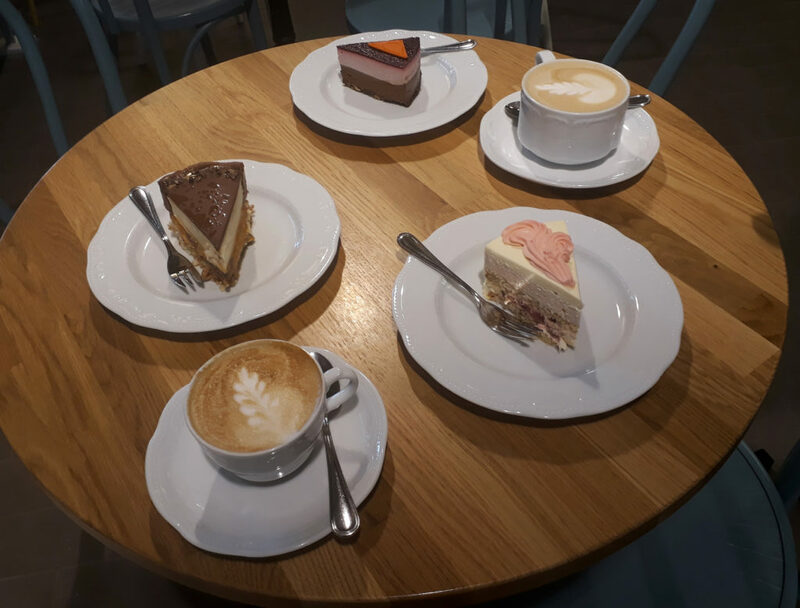 Welcome back to my project of slowly reviewing all the coffee and cakes in Tallinn with my friend Greta, this week: a little oasis in Balti Jaam. Review: While Ristikheina Kohvik does have another location, we ended up at the one in Balti Jaam because it’s just too dang convenient. Easily reachable by the 1 or 2 tram, by train, or by a half dozen buses it’s located at the entrance of the Balti Jaam Turg. It’s really almost impossible to miss the lovely stand for this coffee shop. Located on the main floor snugly between a few other vendors, Ristikheina has a rustic, homespun charm to its storefront. 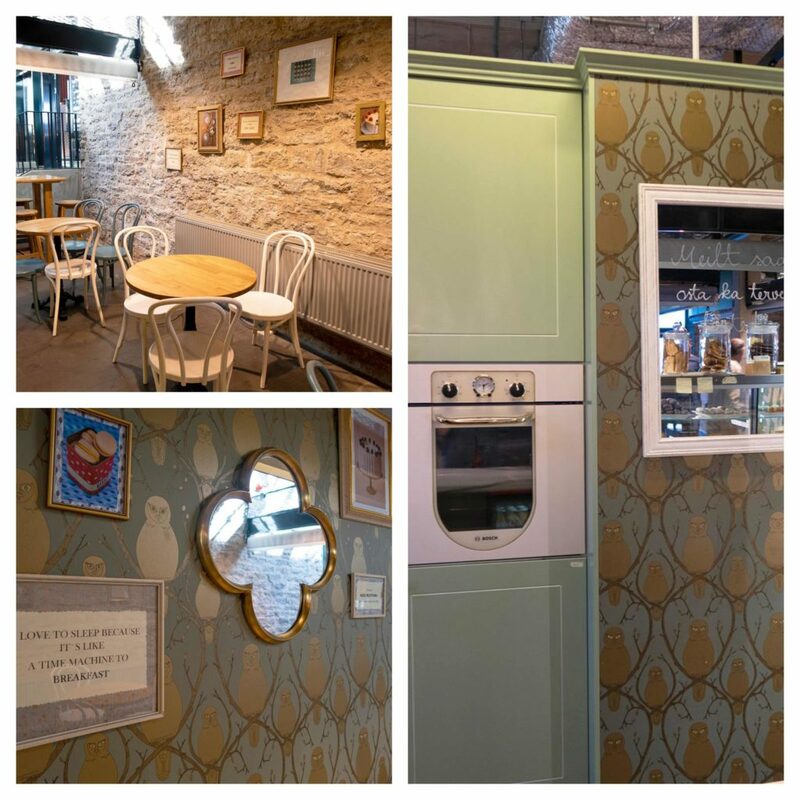 The wall behind the counter is lined with golden owl wallpaper and the appliances exude all the 1950s white picket fence charm you can stomach. There is some fairly average no nonsense seating located behind the counter as well with tables ranging from small enough for one person all the way up to an entire slab of counter space. The space is very functional but has a warm vibrant color scheme and there are several plaques, mirrors, and matching wallpaper to make the space feel more friendly than its bustling surroundings. 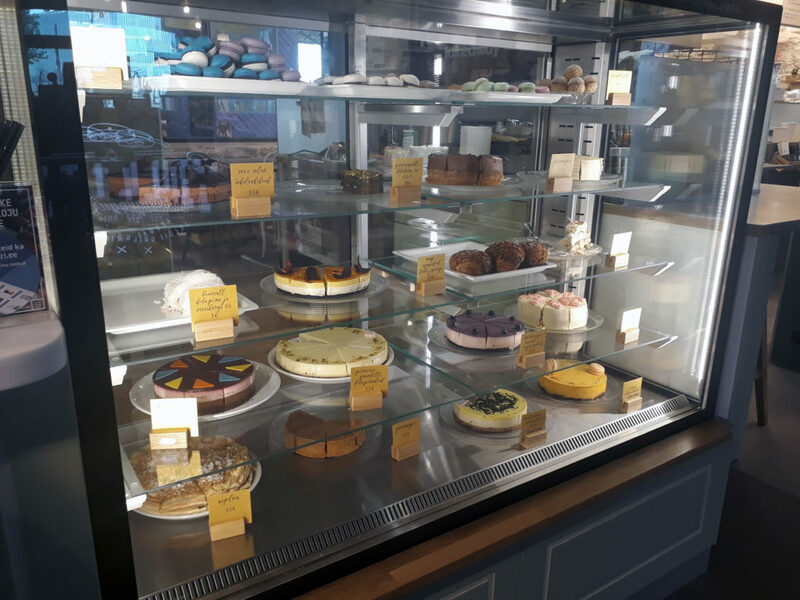 The service was great and there are a wide selection of cakes and interesting looking savory offerings lining the counter in big glass cases making it a fun focal point. It took us quite a few minutes to pick which cakes we wanted because they all look intensely wonderful. The cakes were often out of the ordinary flavors and they change weekly (or maybe even daily in some cases), so you will likely always have something new to look forward to. The cost is closer to average than I would have thought for its location and the selection of drinks is just your standard coffee menu. 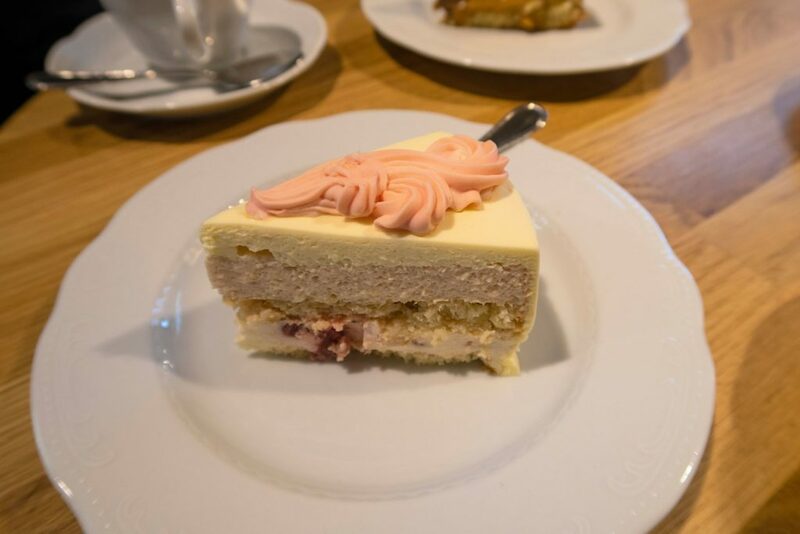 There are other coffee and cake shops in the market so it’s worth looking around to make sure you get what you want but the fact that Ristikheina offers over 10 types of cakes makes it an easy sale. First cake is the easiest to explain, the Strawberry-Rhubarb Cake. The cake looks like summer feels which is perfect for the weather we’re having. I love the layers and the decorative icing on top especially. This cake had a really clean, fruity taste. You could actually taste the rhubarb and there were some pieces of strawberry along with nuts in the bottom layer for texture. The icing on this one was really soft and despite its looks was not too sweet. I’m not a huge fun of rhubarb so this was just okay for me but Greta really enjoyed it. The next two cakes were both labeled as “daily dessert” which is a great description containing ZERO information. I picked this cake because it reminded me of mod era fashion. This was an odd cake. The white chocolate decoration is just, there. I wanted this to taste like ice cream but actually it was quite sour and more like a mash up of cheesecake and ganache. 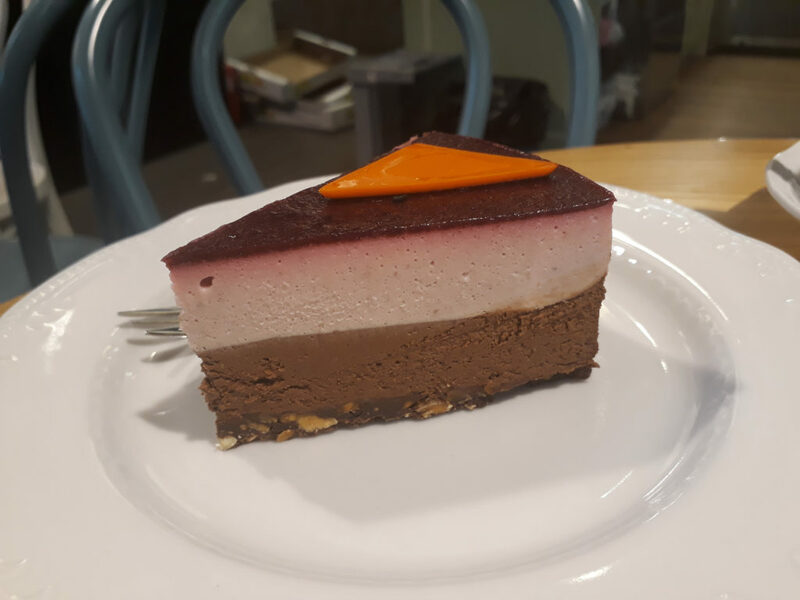 The jam layer was either cranberry or currant, it had a sour and astringent taste that was off-set by layers of thick cheesecake and chocolate. The crust was melted chocolate with nuts and a touch of caramel. Everything about this cake is too much. The taste is good but it’s so rich and sweet and sour and thick all at the same time I was glad we split the piece. The last cake was another mystery “daily dessert” but this one taking on a much more familiar form. I’m going to level with you, this was a Snickers cake. If there is one thing I love in life, it’s Snickers bars and this cake delivered on that taste and sensation. The world’s softest cake served as the base, topped with a layer of creamy caramel with nuts, topped again by a whipped nearly-marshmallow-like cream layer all coated in a thin layer of ganache. This tasted exactly like a Snickers bar and just absolutely nailed the texture as well. Not too soft but perfectly melt in your mouth good. I wish we’d eaten three slices of this instead of the other two honestly but your mileage may vary. Overall, this was a mixed experience. 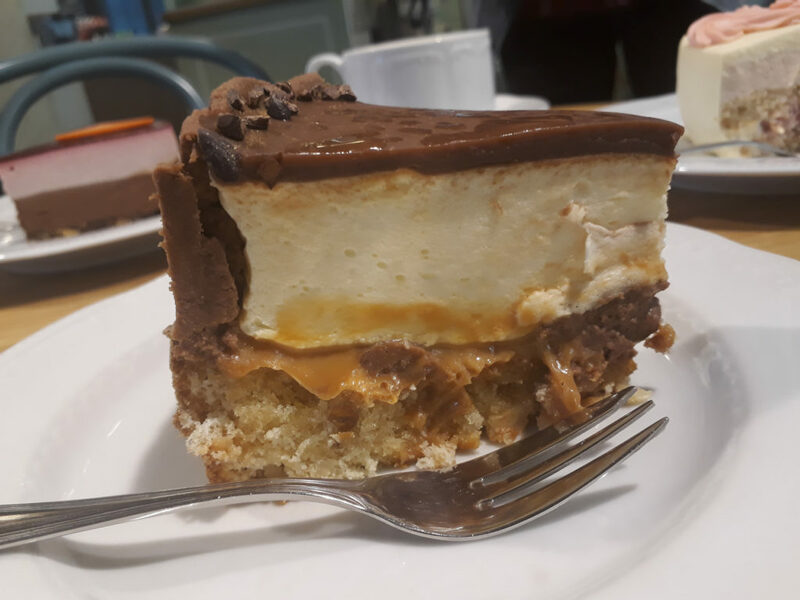 The coffee was literally nothing to write home about, the service was fine, and the cake selection was very beautiful but the cakes themselves ranged from meh to amazing. I’d absolutely go and try more of the cakes there because I’m a sucker for beautiful things but it’s really starting to drive home that flashy bakeries might not be the most wow-ing taste experiences. All in all I’d only go here if I found myself in the market but I wouldn’t go out of my way.